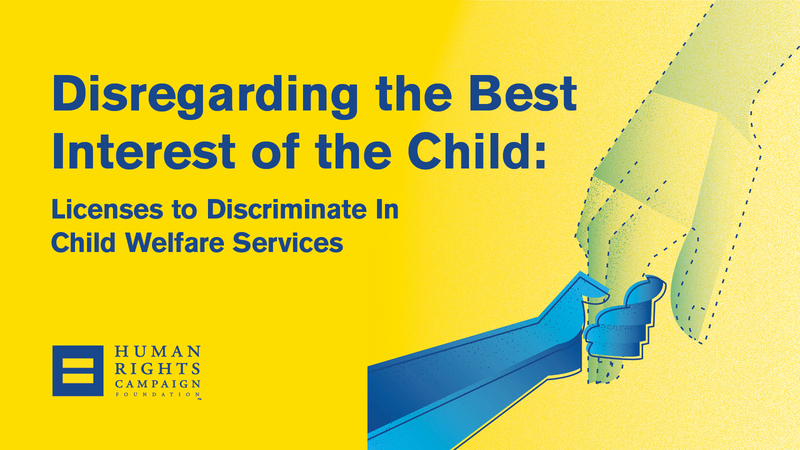 Today, the Human Rights Campaign Foundation released Disregarding the Best Interest of the Child: License to Discriminate In Child Welfare Services, a report detailing the harms of efforts to write anti-LGBTQ discrimination by child welfare agencies into law. The publication of the comprehensive resource comes as legislatures across the country prepare to reconvene in January, with many states poised to consider anti-LGBTQ bills. Seven states, including five in just the last three years, have passed laws granting a license to discriminate against LGBTQ people in foster care and adoption services. In 2017, the number of anti-LGBTQ child welfare-related bills nearly doubled, from four to seven. Laws like these allow agencies to refuse to work with LGBTQ people; some even allow them to refuse to provide certain types of medical treatment to LGBTQ children in their care. The guide outlines several false assumptions which are often relied upon to justify these bills, and explains that these bills artificially limit the pool of potential foster and adoptive parents at a time when more parents are desperately needed, and that they funnel taxpayer funds to agencies that are perpetuating discrimination. Statistics suggest that an estimated two million LGBTQ adults in the U.S. are interested in adoption, but the LGBTQ community often remains an untapped resource when it comes to finding families for children and youth in foster care. In Congress, there is legislation that would create license to discriminate bills impacting child welfare services — the deceptively named First Amendment Defense Act and the Child Welfare Provider Inclusion Act. The report explains how these, and an Executive Order issued in May and followed by guidance from the Office of the Attorney General in October, could perpetrate similar harms on the federal level. It also details the legislation that would prevent such discrimination - including the Equality Act and the Every Child Deserves a Family Act. HRC is on the frontlines of expanding access and inclusion within America’s child welfare services, from combatting license to discriminate laws at the state and federal levels to working with youth-serving professionals on the ground. HRC's All Children – All Families (ACAF) project promotes LGBTQ cultural competency among child welfare agencies through innovative resources, including an online agency self-assessment tool, comprehensive staff training, free technical assistance and more. Agencies across the country recognize the importance of this work and use ACAF resources to improve practice with LGBTQ youth and families. To read the new guide, visit Disregarding the Best Interest of the Child: License to Discriminate In Child Welfare Services.